A learning and reflection blog. Seeking to better understand how we process information, how we learn, and how we educate. This video is a pep talk to all those educators out there who doubt that they have good ideas to share. Participating in a professional learning community means more than simply connecting to resources and experts, it also means contributing your own ideas. I think many teachers shy away from sharing, thinking: my ideas aren’t good enough to share (as the video illustrates). I experienced something similar to the situation in the video: I started using @EDPuzzle, and I really liked it. I liked it so much, that I wanted to share it with others. To do this, I made a Google Slides presentation with instructions and screenshots for how to get started with EDPuzzle. Now, EDPuzzle has their own instructional tutorials on how to get started (and their instructions are better than mine). More than that, some of the screenshots and instructions in my presentation are a little outdated. Still, I made this presentation and sent it to my colleagues to show them how to get started with this instructional tool. I was also sure to set the sharing settings so that it was public on the web, just so it would be easier for others to see. I thought nothing of this presentation for a long time, and then out of the blue I got emails from teachers out of my district–out of my state! 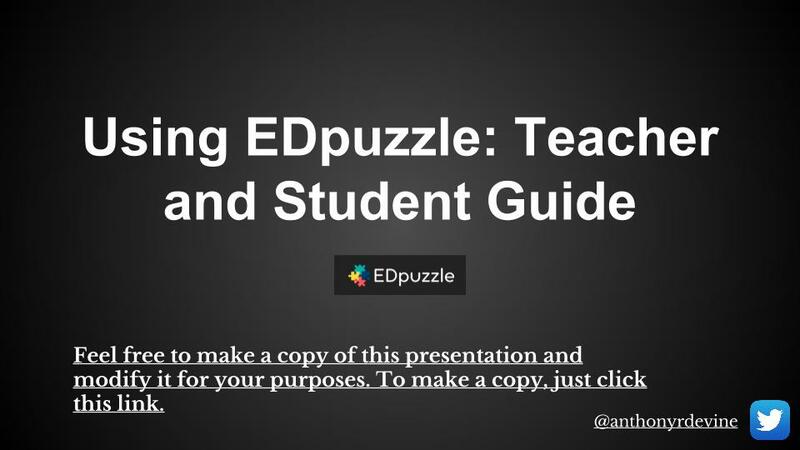 They were asking for permission to use this presentation to help their own colleagues get started with EDPuzzle. Of course, I told them to go for it–make a copy and modify it for their needs. I even changed the title slide to include a link that makes a copy of the presentation (see above). I’ll admit, I felt proud that a presentation I made was being looked at (sought out) by educators I didn’t even know. It told me that the idea I had (to share this cool instructional tool and make it as easy as possible for others to get started with it) was valuable to others. It told me that my idea helped others. But the part of this experience I really appreciates goes back to the idea in the video at the top of this post: This wasn’t some spectacular insight. This wasn’t an epiphany that would reshape the pedagogical world. This was just a “how to” presentation for getting started with a useful edtech tool. Still, by sharing I was able to contribute to more educators and more students than if I had decided to keep my ideas to myself. I hope the non-sharers out there have a change of heart. It would be great to see more educators contributing their ideas so we can all better serve our students. This entry was posted in Education Technology, Professional Learning on August 12, 2016 by admin.